iFixit's teardown is ongoing as of this writing, but the firm is posting pictures of the process on its webpage. This year, the company flew out to Japan to obtain its launch day dissection subject. Upon first glance, iPhone 7 Plus appears to be largely similar to iPhone 6s Plus, save for the dual-camera array and lack of headphone jack. The phone's connective tissue is also unchanged, as two pentalobe screws secure the display assembly to the 7000 series aluminum chassis. Then things begin to deviate. Compared to last year's model, iPhone 7 Plus contains a stronger adhesive tape iFixit believes might be related to waterproofing. Another change, this year's iPhone opens to the side like a book, whereas the display on previous versions flipped up like steno pad. Cabling and other connectors have been reworked to support this new arrangement. Photos also revealed a 2,900 mAh battery, up from the 2,750 mAh cell found in iPhone 6s Plus. Coupled with Apple's new A10 Fusion processor, which promises to deliver both speed and efficiency with a unique quad-core design, the smartphone should see a boost in time between charges. Announced last week, and subsequently defended by Apple executives, iPhone 7 and 7 Plus no longer feature a 3.5mm headphone jack. In its place, iFixit found what looks to be a non-functional speaker port. Just above the faux speaker port is the enhanced Taptic Engine module that generates phone vibrations and powers the new solid-state home button. 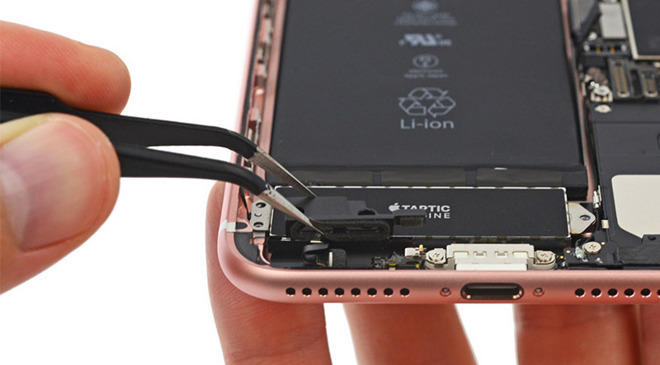 Compared to the iPhone 6s, this year's Taptic Engine appears to be a quite a bit taller, suggesting the unit's internal weights were enlarged for enhanced feedback. Moving to the dual-camera system, the teardown confirms suspicions that Apple is using two identical sensor modules outfitted with specialized lens packages. The wide angle imager, thought to be identical to iPhone 7's iSight camera, comes with an optical image stabilization system and new lens array, while the telephoto shooter lacks OIS. On the logic board lives Apple's A10 Fusion processor, with 3GB of Samsung LPDDR4 RAM, a Qualcomm MDM9645M LTE Cat. 12 Modem and components from Skyworks and Avago. Intel is also supplying modems for iPhone 7, specifically handsets operating on AT&T and T-Mobile networks in the U.S.
Apple's iPhone 7 Plus went up for pre-order last Friday alongside the 4.7-inch iPhone 7 and the new Apple Watch Series 2. On Wednesday, Apple announced initial supply of all iPhone 7 Plus versions, as well all jet black iPhone 7 models, had been depleted.